Last week, I recommended three recent films from France that moviegoers may find richer and more thought-provoking than this year’s crop of Oscar-nominated features. But France isn’t the only country producing great works of big-screen art. There were many films released around the world in 2009 that make most of Oscar’s Best Picture nominees seem simplistic and shallow by comparison. Here are a few you might want to add to your Netflix queue. They’re more demanding than the disposable popcorn flicks you’ll find at the Cineplex. But if you pay close attention, you’ll find that these films stay with you. Lake Tahoe is made up of long, quiet scenes in colorful, roughly textured environments, interrupted by sudden black-screen interludes. This creates an interesting rhythm, acquainting us with the sights and sounds of a small, quiet Mexican town, as a troubled young boy named Juan emerges from a crashed car and goes looking for a mechanic. The first question on our minds is, what happened to the car? But we should be asking, What happened to the boy? The cause of the crash is related to the cause of his gloomy demeanor. At first, it seems we’re just dropping in on random scenes as Juan wanders through the town. But as we slowly piece together what’s happened, we begin to see that every scene is really about the boy’s inner turmoil. What has he lost? What does he need? Will he find a mechanic for his car? Will he find somebody who can repair his own internal damage? This is a movie with a broken heart and a vivid imagination. Watch the Lake Tahoe trailer. If onscreen violence and depravity make you squeamish, you may want to steer clear of Gomorra — but then, doesn’t the title give you a clue? Matteo Garrone’s sprawling examination of mafia corruption in Italy does not give us the kind of impressive gangsters that have become giants in the landscape of American cinema. Instead, it focuses on the consequences of mafia activity on the rest of a culture. We see how the acts of the greedy and powerful are poisoning the ground beneath the feet of Italy’s working poor. We see how neighborhoods are becoming battlefields for gangs. We visit politicians who ask their assistants to abandon all conscience in order to carry out the wishes of mobsters. We watch toxic waste buried where it will contaminate innocent bystanders. And we watch impressionable youth, inspired by big-screen gangsters like Scarface’s Tony Montana, learn the hard way that they can’t gun their way to success. While this is clearly foreign territory for most American moviegoers, the film is ultimately unsettling as it reveals just how the actions of these criminals have poisoned our own consumer culture, making us complicit in their crimes. Watch the Gomorra trailer. There were some fantastic roles for actresses this year. Unfortunately, Catalina Saavedra’s turn as Raquel, a 41-year-old housemaid, is easily overlooked. The character seems quiet, practical, and even homely compared to those played by Meryl Streep, Sandra Bullock, Helen Mirren, and Tilda Swinton. But it’s a mistake to ignore just how complicated Raquel really is, just as it’s a mistake to ignore Saavedra’s performance. The actress conveys Raquel’s growing psychological turmoil with scary intensity and subtle humor. Raquel doesn’t have the stamina she once did. She’s suffering fainting spells, and the family she’s served for generations has begun to upset the order she once established. When her employers begin interviewing other women to cover additional housework, Raquel rebels, terrorizing the newcomers. What might have become a very black comedy or a tragedy of psychological disintegration becomes something else entirely — a redeeming depiction of a heart transformed by tough love. 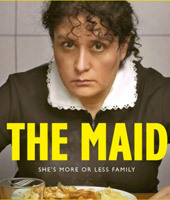 Watch The Maid trailer. We currently surrounded by stories about lost jobs. But they’re nothing like the story of Karim, a trouble-prone Iranian job-seeker who was fired from an ostrich farm after he let an ostrich escape. In this profound new film from Iran’s popular filmmaker Majid Majidi, Karim’s unemployment is complicated by another hardship: His daughter needs an expensive new hearing aid. So we watch Karim’s desperate and hilarious attempts to recapture the ostrich. Then, we watch him discover a new possibility. Capitalism is transforming the economy of Tehran. Joining the treasure hunt of aggressive opportunists, Karim (Mohammad Reza Naji) suddenly finds work as a motorbike-taxi driver. Helping the fast-moving businessmen who have a need for speed, he discovers that he can get rich quick. But he also discovers that consuming is easier than saving. The city is a wonderland of temptations, and what feels like newfound freedom for Karim is actually the destructive grip of greed. The Song of Sparrows is a beautiful parable about the dangers of consumer society, and about what happens when an abundance of pleasures close our eyes to our families and our ears to the voice of God. Watch The Song of Sparrows trailer. Lorna, a young and beautiful Albanian, has married Claudy, a young Belgian drug addict, so that she can win Belgian citizenship. Claudy’s playing along on the understanding that he’ll then divorce Lorna, and be paid for doing her a favor. Meanwhile, a Russian mobster is waiting for this to play out, so that he can then marry Lorna, and gain Belgian citizenship himself. It’s a crooked scheme, made all the more complicated by the dangerous development of love. Lorna, like the crooks who manipulate her, is cold, hard, and determined to see this crime through so that she can open a convenience store with her boyfriend, Sokol, and start a new live. But she’s not so heartless that love cannot do a transforming work in her life. And when Claudy’s addiction begins to tear him apart, a spark of compassion — and maybe something more — interferes with Lorna’s commitment to the scam. Arta Dobroshi gives a masterful performance, making Lorna a quiet and unpredictable character. Jérémie Renier, who may be the most compelling French-speaking actor of his generation — he’s also in Summer Hours — is unforgettable as the crumbling heroin addict. Late in the film, the storytellers stun the audience by skipping ahead several chapters, leaving the viewers to try and imagine what might have happened in the gap. It’s a brave decision that leads to a mysterious and troubling conclusion, one that will send you back into the movie, and provoke a lot of debate. Watch the Lorna's Silence trailer. “A poem needs understanding through the senses.” That’s what the poet John Keats says to his beloved Fanny Brawne in this radiant and romantic film from director Jane Campion. These words are equally true of the film in which they are spoken. Bright Star is beautiful not only in its poetic script, but also in its nuanced performances and the painterly grace of its imagery. The Academy should have remembered Abbie Cornish’s performance as Fanny Brawne. It’s one of this year’s big-screen wonders. Watch the Bright Star trailer. Roger Ebert called it “a masterpiece.” But even before he wrote about it, Response celebrated this extraordinary new film by the Korean-born American filmmaker Lee Isaac Chung. Chung traveled to Rwanda with a Youth With a Mission (YWAM) team and helped some young Rwandans make a movie about their country, their scars, and their hope for reconciliation. You can read that earlier Munyurangabo review. Have you seen any of these movies? What did you think? And what movie should have been nominated for a 2010 Academy Award, but wasn't? Tell us, and see it posted below. Check out other Response exclusives and updates.